Extreme” imaging collects highly undersampled or inaccurate measurements, and provides significant benefits to diverse imaging applications. The examples in medical imaging include highly undersampled MRI to reduce imaging time, sparse-view CT to reduce radiation dose and cancer risk from CT scanning, etc. However, obtaining an accurate image within a reasonable computing time is challenging in extreme computational imaging. Since 2016, researchers have been applying a convolutional neural network (CNN) to overcome the aforementioned challenges. However, applying image mapping CNNs naively in an image “denoising” perspective can potentially generate artificial features. One can expect to regulate such artifacts by incorporating CNNs into iterative signal recovery (ISR) that naturally considers physics of imaging systems. This talk introduces our three ISR frameworks using (un)supervised CNNs. The first half of this talk introduces our recent 1) ISR framework using CNNs trained via convolutional analysis operator learning (CAOL) in an unsupervised fashion, and 2) new block proximal gradient method using a majorizer (BPG-M) for fast and stable CAOL; and shows 3) a benefit of the developed ISR using CAOL to sparse-view CT collecting only 12% projection measurements. The ISR approach using unsupervised CNNs enjoys some theoretical guarantees and shows good practical performances; however, it can need several hundreds of iterations to converge, detracting from its practical use. The second half of this talk introduces our 1) first recurrent CNN architecture, BCD-Net that unfolds block coordinate descent (BCD) algorithm using CAOL, designed to resolve the convergence issue by training autoencoding CNNs in a supervised fashion; and shows 2) a benefit of BCD-Net to highly undersampled MRI collecting only 10% k-space data, and low count PET counting only 5% photons. Additionally, I introduce our second recurrent CNNs architecture, Momentum-Net where BPG-M meets fixed-point iterations, that guarantees convergence while using general image mapping operators. Making extreme computational imaging practically feasible breaks new ground in providing safe and comfortable medical imaging to patients, and developing reliable early-stage brain abnormality detector. Il Yong Chun received the B.Eng.E.E. degree from Korea University, South Korea, and the Ph.D. degree in electrical and computer engineering from Purdue University, USA, in 2009 and 2015, respectively. From 2015 to 2016, he was a Postdoctoral Research Associate in Mathematics, Purdue University, USA. He is currently a Research Fellow in Electrical Engineering and Computer Science, the University of Michigan, USA. 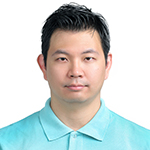 His research interests include convolutional operator learning with big data, deep neural networks in signal recovery, compressed sensing, and nonconvex optimization, applied to “extreme” computational imaging and translational neuroimaging.